Forest bathing is the latest health trend—but what exactly is it, anyways? Translated from the Japanese term shinrin-yoku, forest bathing is also known as forest therapy. It’s kind of like hiking through the forest. It’s kind of like meditating amongst the trees. Yet it’s not exactly either. “I’ve been doing forest therapy all my life, and I didn’t know there was a term for it,” says Haida Bolton. From British Columbia’s Sunshine Coast, Bolton describes how she grew up in BC and has always felt uplifted by taking contemplative walks through the rainforest. When she first heard of shinrin-yoku, she found the science behind it intriguing. Based in Pender Harbour, Bolton runs nature day camps for children and offers both indoor and outdoor reflexology. In 2016, she was certified by the Association of Nature & Forest Therapy as BC’s first Forest Therapy Guide. The organization, based in California, promotes the Japanese concept of shinrin-yoku, or taking a slow walk in the woods and absorbing the surroundings with all your senses. Here’s how Bolton explains the practice. While hiking involves moving purposefully across terrain, forest bathing isn’t about following a defined route. Bolton’s forest therapy walks, which last about 2-1/2 hours, may span only about one kilometre. “This experience is much slower,” she says. “The guide will really slow down the participants and get them to interact with the forest with all their senses.” Rather than the destination, the point is to focus on the details of the journey. But unlike an interpretive nature walk, the guide’s role isn’t to explain the flora and fauna. Rather, the guide facilitates the contemplative experience, offering participants “invitations” to interact with the forest in a meaningful and healing way. For example, participants will be invited to use their eyes, paying attention to what’s in motion. “Sometimes there are lots of birds flying, and that’s easy to see. Sometimes it’s the wind blowing—the slightest breeze is making one little leaf twirl in circles,” she explains. Other times participants will focus on sound or touch. “How many of us really slow down and feel the different textures in the forest?” she asks. Even the sense of taste is stimulated. At the end of the session, there’s a tea ceremony that highlights the edible plants of the forest such as lemon balm, licorice root, or a hemlock tree’s citrusy new spring growth. While some people liken forest bathing to meditation, it’s not necessarily a solitary experience. It is, however, a mindful one, with a similar experience of slowing down and really being in the moment. 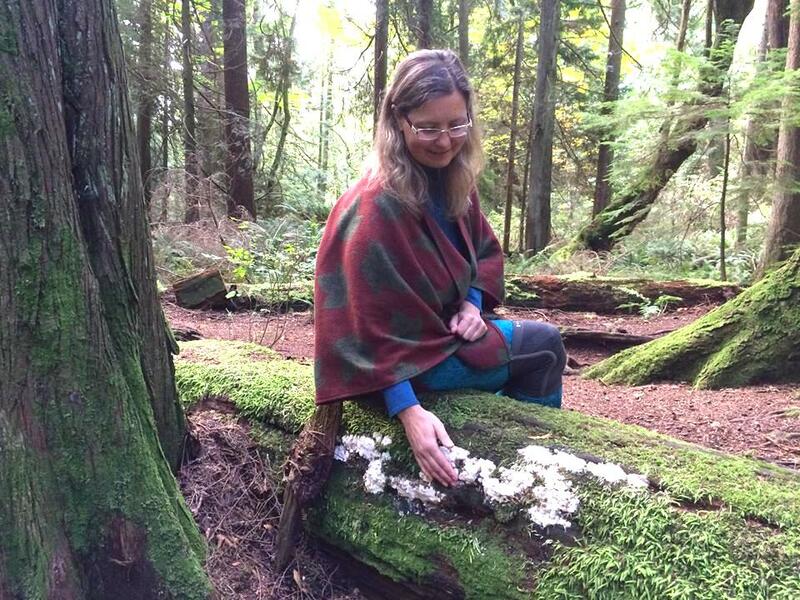 Haida Bolton leads forest bathing groups from her base in Pender Harbour on the Sunshine Coast. The calming benefits of spending time in nature are well documented. A blog by Vancouver’s David Suzuki Foundation sums them up, including decreased anxiety and a strengthened immune system. Japanese studies have shown that people who spend time in the forest inhale beneficial bacteria, plant-based essential oils, and negatively charged ions. The Association of Nature & Forest Therapy lists myriad benefits including reduced blood pressure, increased energy, and increased ability to focus. Haida Bolton offers guided forest therapy walks on the Sunshine Coast. She also travels to Coombs on Vancouver Island to lead walks there; see Nature With Haida. 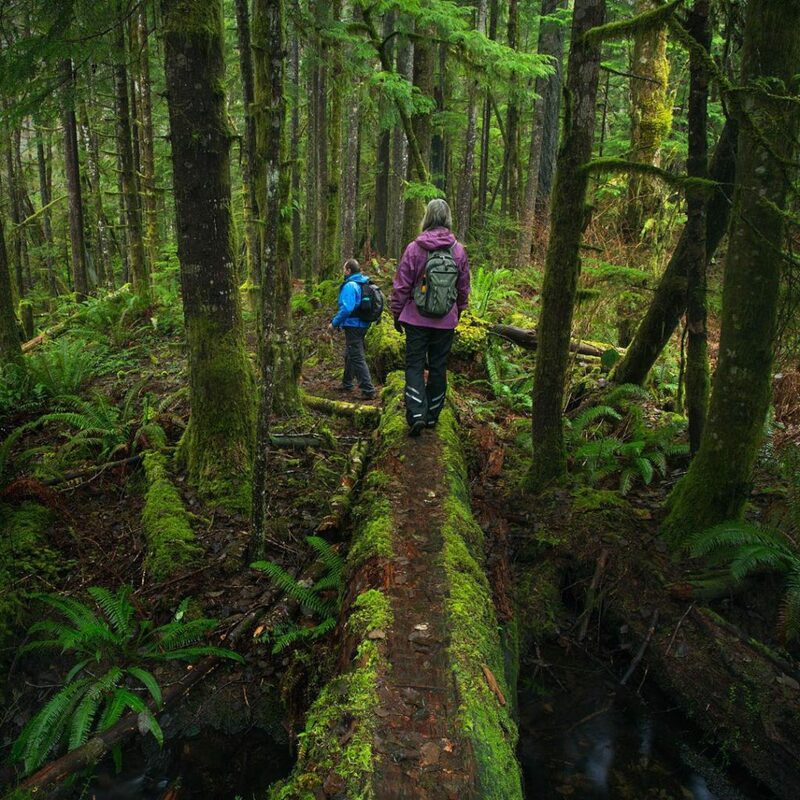 From their base in Parksville on Vancouver Island, Pacific Rainforest Adventure Tours take guests on a gentle walk through an off-the-beaten-track forest with old-growth trees and native plants. 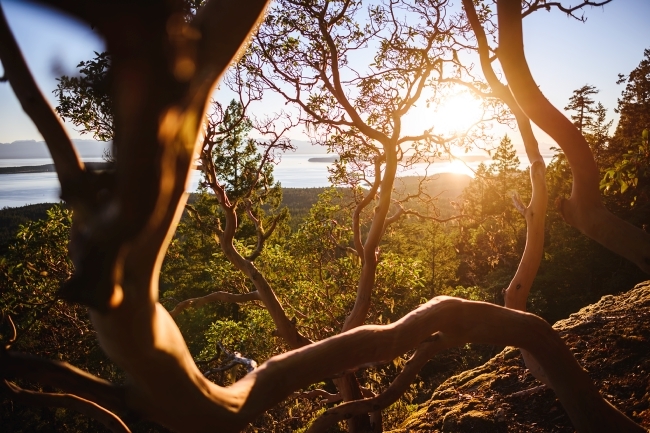 In conjunction with Pacific Rainforest Adventure Tours, Tigh-Na-Mara Seaside Spa Resort & Conference Centre offers a Reconnect Package that includes accommodation and a forest bathing tour, plus mineral pool access at the resort’s Grotto Spa. 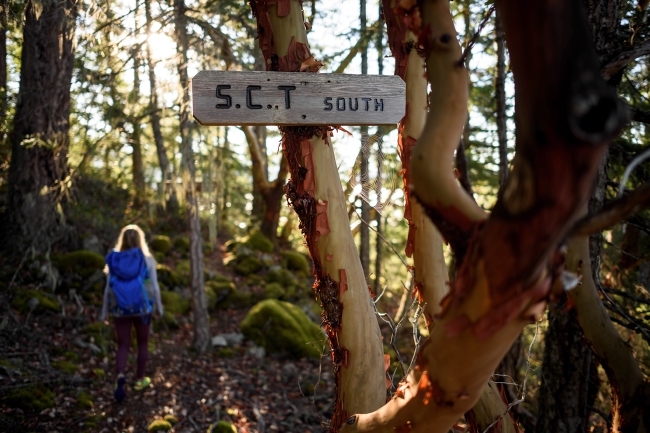 For those who lean towards hiking, the Sunshine Coast Trail was designed to be hiked in a contemplative manner. The 180-kilometre (112-mile) backcountry trail, which stretches from Sarah Point in Desolation Sound to Saltery Bay, is Canada’s longest hut-to-hut hiking experience. 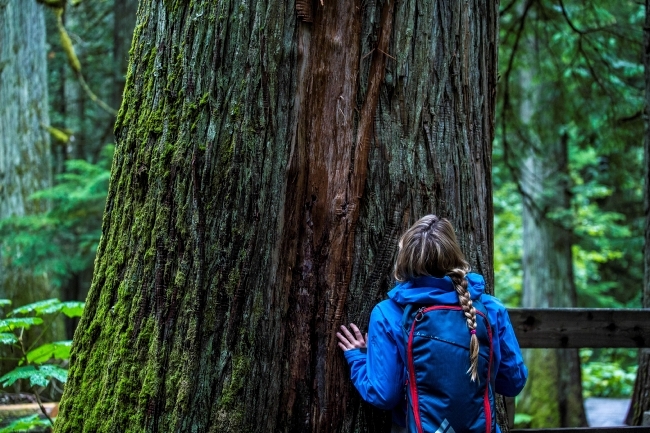 With close to 25% of the world’s temperate rainforest in British Columbia, there are plenty of places to be one with the trees. 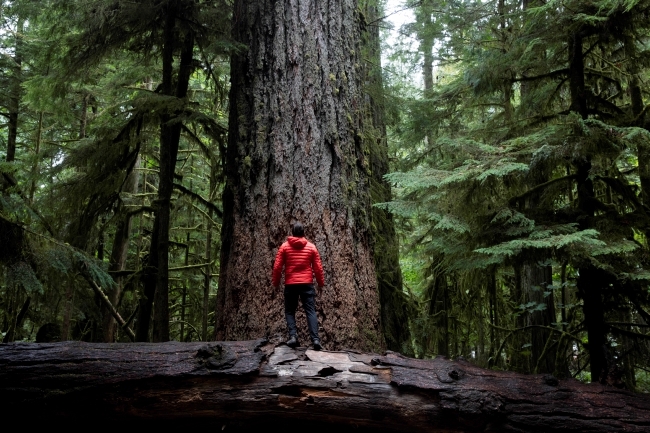 For more ideas on where to go, see Top 5 Places to Experience the Rainforest in BC. Updated from original publication April 21, 2017.